The following text will be published in the program for Snow Angel, presented on November 25 and 26, 2017. In 22 years, Camerata Nova has never done a concert celebrating, and designed for, youth. Plus, although Snow Angel certainly has a Camerata Nova Christmas flavour, we have never designed a concert with a fair quotient of lighter, “pop-style” music. In Snow Angel, Vic Pankratz has dared to do both things. We are proud to have 15-year-old, award-winning cellist Juliana Moroz and the Sistema Winnipeg Choirs from Elwick and King Edward Schools joining us. We are also happy to occasionally veer off our normal path to offer accessible, quality contemporary music that kids can relate to and all of us can relax and enjoy. To give fans of Camerata Nova’s more traditional music a segue into this new world, the concert starts in a more characteristic way with the first of three settings of O Magnum Mysterium (O Great Mystery) being performed, beginning with Tomas Luis de Victoria. O Magnum Mysterium is one of the most beautiful and well-known of ancient Catholic prayers, reserved for Mass on Christmas morning. Over the centuries, it has been set to music by dozens of composers. The exquisite Victoria setting is perhaps the gold standard of them all. A late Renaissance Spanish composer, singer, organist and priest, Victoria was known for the mysticism and emotion in his writing. It shines forth in this delicate, elegant work. Ave Maris Stella (Hail, Star of the Sea) is another popular prayer or plainsong hymn to Mary, sung at evening Mass as far back as the eighth century. While the words are age-old, the composer, Don Macdonald, is an eclectic jazz musician and film composer from British Columbia. The harmonies in his Ave Maris Stella are modern but evocative of the Renaissance with snippets of polyphonic texture throughout. To tip our hat to Canada’s 150th birthday, Vic Pankratz has found music from a range of Canadian composers and arrangers. In fact, of the ten composers on the program, eight are Canadian. Québec organist, folklorist, teacher, historian, writer and administrator Ernest Gagnon is a towering figure in the history of Québec music. He was a virtuoso organist at the Notre-Dame Basilica-Cathedral (Québec City), author of several books describing the musical history of early Québec (including Indigenous music) and compiler/editor of Chansons populaires du Canada – the bible of early Québec folksongs. Camerata Nova is performing three of his arrangements from his Cantiques populaires pour la fête de Noël (Popular Carols for the Christmas Season) published in 1909. They should evoke lots of holiday memories for our Francophone audience members! It’s a tradition at Camerata Nova holiday concerts to hear new, made-in-Manitoba arrangements of Christmas music. This year, we approached it slightly differently, inviting Mel Braun and Andrew Balfour to write their own music to O Magnum Mysterium. No surprise, they each approached it entirely differently. In Mel’s inimitable, quirky style, he looks at the birth of Jesus from the point of view of the animals. Listen for the sounds of cows, goats, sheep, birds and even cats. Braun has pulled off an amazing mélange of the funny and the respectful and serious – who are we to say that humans were the only ones to be awed by the birth of Christ? Originally American, Miles Ramsay spent years, in his own words, “criss-crossing the United States as the lead singer and drummer in a lounge band – you know, the kind we make fun of today. At the time, it all seemed pretty cool, singing in the same Vegas lounges that were home to the likes of Mel Torme and Don Rickles.” Ultimately it got stale and he settled in Vancouver. In addition to many creative choral arrangements, Miles’ claims to fame are that he is a serious, professional Vancouver choral singer and the composer of the Great Root Bear theme for A&W (which has been played by every high school tuba player since 1973 – check it out on You Tube)! Ramsay writes one carol arrangement each year. His versions of What Child is This? and Deck the Halls are unusual, out of the traditional context with jazz chords and meter changes – challenging but fresh and fun to sing. 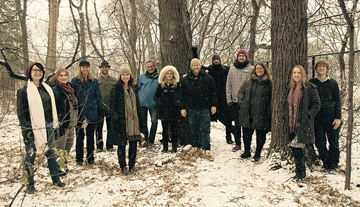 Snow Angel by Canadian Sarah Quartel is the central work of this concert. Scored for choir, solo cello, djembe and piano, it is in five movements. In the composer’s words, “Snow Angel asks you to see the tremendous potential present in our children. It celebrates love, beauty and the strength that a child’s voice can bring to our troubled world.” Most of the piece has an ethereal, mystical feel – fitting for a work peopled with a choir of angels. Movement 4, Sweet Child, however, morphs into an emphatic rap/anthem with a distinctly African feel and vibrant part for the djembe. Throughout, the musical language is emotive and pictorial, allowing performers to play an active role in the storytelling. 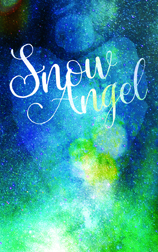 Particularly popular with young people, Snow Angel has caught on in the choral world and is now being performed around the world. Quartel also weaves a haunting, poignant cello line throughout the piece. We are very pleased to have Juliana Moroz performing today. At 15, she has already established her talent and credentials, winning the Aikins Memorial Trophy for top instrumentalist at the Winnipeg Music Festival last March – an outstanding feat for someone of her age. Youth from all over the city are producing marvelous music! Shifting gears, Andrew has had fun putting together his Polar Suite. Tongue in cheek, it expresses his bemusement at the thought of Santa’s Village at the North Pole side by side with our Inuit communities. I Saw Mommy Kissing Santa Claus, Up on the Rooftop (Igloo?) and Santa Claus is Coming to Town are choral grist for the mill as Balfour creates a polar “medley,” replete with northern vocal soundscapes, while Inuit narrator Fred Ford recites the words to these popular songs in Inuktitut. We would like to thank Mary Nirlungayuk, Vice-President of the Manitoba Inuit Association, for her translations. Throughout this concert, Vic Pankratz has woven in themes of connection, caring and coming together – In diversity and despite adversity. These seem fitting sentiments in this disjointed time. To reinforce our sense of community, the concert ends with Camerata Nova and Sistema singing Hope for Resolution by Sean Ivory and Paul Caldwell. This well-known piece juxtaposes a European chant melody, Of Our Father’s Love Begotten, with a Zulu anti-apartheid song called Thula sizwe (Nation, Do Not Cry). The arrangement reflects respect for divergent styles and points us towards our innate potential for peaceful co-existence. Thanks, Vic, for encouraging us to sit back, celebrate our young people andenter into the holiday season in a spirit of love and community!